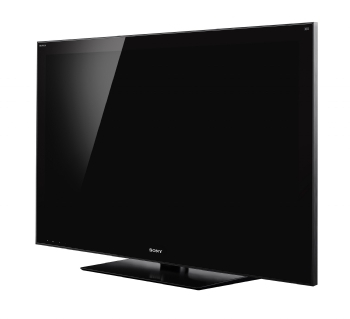 Like it or not, 3D HDTV is here, and could make a huge splash in the consumer electronics market over the coming years. It seems like only yesterday when 1080p and 120Hz were the top of the line specs for which our eyes lusted and our wallets despised. Well, that’s old-hat now, and it’s time you got yourself educated on the 3D technology that will define HDTVs in 2010 and beyond. Now, let’s get the obvious out of the way: 3D technology is nothing new. Scientists have experimented with 3D visuals since the invention of moving pictures, and commercial 3D films can be dated back to the 1950s. But somewhere between then and now, 3D lost its charm as serious technology, and gained a reputation for being kitschy and frivolous. Today, companies like Sony and LG are preparing large campaigns to get 3D TVs into millions of homes. The playing field is definitely changing, but there are still some ghosts in the closet that 3D can’t run away from. Those funky red-and-blue tinted glasses are as much an icon of 3D as bad horror movies and the resulting headaches. Old 3D movies used a technology known as anaglyphs. The glasses forced each individual eye to perceive separate images based on the color filtered through the lens. When your brain puts the two images together, depth can be perceived and a 3D effect is born. The downside of using anaglyphs, however, is that you lose all sense of color. Perhaps in the 50s, the absense of realistic color was less of an issue since technology was still transitioning from black-and-white images, but today 3D anaglyph technology would be a slap in the face to pretentious directors everywhere. A better result can be achieved by using polarized images and glasses to simulate a field of depth. Polarized 3D takes more or less the same approach as anaglyphs by superimposing two images on the screen that are then filtered by glasses that deliver separate images to your eyes. But instead of filtering based on color, polarized 3D glasses restrict polarized light. Color integrity is more or less maintained using this method, and polarized 3D is the standard currently used for IMAX 3D films. 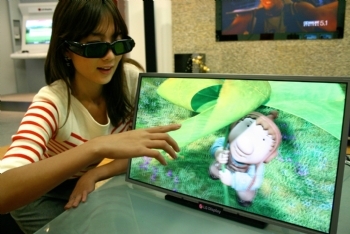 This LG 3D display requires shutter glasses. Another form of 3D tech that uses glasses is shutter technology. Whereas anaglyphs and polarized 3D filter out unwanted images, shutter glasses physically block the image from reaching your eyes. Shutter glasses–as the name suggests–have shutters in both lenses that alternate at a very fast rate and completely block one eye at a time from viewing the screen. The glases are in sync with an IR transmitter that tells the glasses which eye to block out according to the 3D image being displayed. The main thing that sets shutter glasses apart is that they are not a passive technology. Shutter glasses need a power source to mechanically alternate the shutters and to receive the IR signal. According to Gizmodo, these glasses may start at $70 a pair, so it may become quite the investment for a larger family. Shutter glasses also require a display with a high refresh rate. There has been some questions over whether 240Hz HDTVs make any considerable image improvement over 120Hz sets, but there’s no doubt that such technology will be needed for a smooth 3D shutter glasses experience. The lower the refresh rate, the higher the chance that your eyes will be able to catch frame transition occurring on the screen and on the glasses. Judging from January’s CES showing, HDTV manufacturers are currently betting on shutter glasses technology for the first wave of consumer 3D TVs. Panasonic’s top-of-the-line Viera plasmas will be jumping on the 3D train in the middle of this year and will ship with one set of active shutter glasses made by Real D. On the LCD side, Sony will be shipping its top model HDTVs with active shutter technology and a pair of Real D glasses. With 3D content support from Blu-Ray, ESPN, DirecTV and others, there should be plenty of in your-face broadcasting to justify the purchase of these new TVs. But we still have to wait and see if the in-home experience is worth the hassle of having to buy extra glasses, keeping them powered up, and popping the occasional aspirin. For those of you unwilling to look silly in 3D glasses, there may still be a few options available, just don’t expect them to arrive anytime soon or anywhere cheap. CES 2010 gave us a good look at lenticular lens technology, a glasses-free 3D option. Like a lot of 3D technology, lenticular lens technology is not new; many of you can probably recall busting open a box of cereal or Cracker Jack to find that multi-image graphic that appeared to move. The basis of the tech is the use of magnification to accentuate an image at a particular angle. If you combine two separate images with two different lenticular lenses, you can produce the necessary effect for a 3D television. At CES, companies such as TCL, Magnetic3D, and Alioscopy demonstrated displays that used this techonlogy. were showcasing displays using this technology. Their sets promised up to nine different viewing angles, giving you a bit more wiggle room for viewing, and hopefully lending these kinds of TVs to real world uses. 2D viewing on these sets is still up in the air, according to Engadget, so they may still need some tweaking in that department before we can see a consumer product. Otherwise, you can expect to see these sets popping up soon as billboards and for other commericial uses. Don’t be surprised if you buy a 3D HDTV this year, take it home, turn it on, and get a blurry mess instead of eye-popping 3D. Beyond glasses and a new TV, there’s still some issues that will make the 3D transition just as frustrating and difficult as the move to HDTV. For starters, you’re going to need new cables, HDMI spec 1.4 to be exact. In addition to 3D, the new iteration of HDMI will support expanded color spaces, 4K resolutions (4 times the standard 1080p resolution), and ethernet over HDMI (the ability to share an internet connection over the HDMI cable). The extra features should make an upgrade ideal even for those who aren’t planning to move towards 3D, but it is a requirement for those making 3D a home theater option. And how about 3D content? Many content developers such as Blu-ray and DirecTV have pledged support, but you may need to buy a new box that will support 3D output. For those of you who use a PS3 as your Blu-ray player, you’ll be pleased to know that Sony is making the PS3 forward compatible with 3D and will most likely utilize a firmware upgrade to support new 3D movies. However, the fate of other 3D Blu-ray players has yet to be discussed and you may need to purchase new hardware. DirecTV users will also be happy to know that its HDTV boxes will only require a firmware upgrade to output in 3D this March. Hopefully, this is a trend that other hardware makes will follow. And finally, even if you get it all the cables and boxes figured out, an unlucky 5-10% will be unable to watch 3D content at all. Turns out some of you have eyes that aren’t quite up to spec on 3D technology, and are unable to perceive depth on a 2D plane. These stereoblind people can do exercises and buy eyewear to train their eyes into seeing 3D on a TV, but is the cost and effort really worth the privilege of buying more consumer electronics? There are many questions left to be answered this year. Will 3D really be the revolution all the big manufacturers want you to think it is? Are you sitting at your computer, credit-card in hand waiting to preorder that first set? In 2010 the big TV story is 3D HDTV; that’s a fact, we just don’t know yet if it’s going to have a happy ending. Geek 101 is an ongoing series that takes a closer look at new, cutting-edge technology. Is there something you’d like us to get down and nerdy with? Look us up on Facebook or Twitter and tell us what you want to see next.